Mac & Wild: The Venimoo, London’s Best Burger? Imagine you’re at home typing away articles that may never be read, and your fiancé walks into the room, having just got home from work, and announces ‘We’ve been invited by Micky and Minnie to dinner with them at a Scottish restaurant. Shall we go?’ What is the correct response to this? When I found myself in this exact position a little while ago, I was somewhat bewildered. Of course I said yes, but it wasn’t without some trepidation. I love Scottish ingredients, the game, shellfish and salmon are unbeatable, and a number of my favourite restaurants in the UK are in Scotland, but the term ‘Scottish restaurant’ puts me on edge. As a phrase it recalls for me a piece of over cooked meat or fish invariably served with some form of potato and deep fried haggis, all swimming in a thick gloopy cream and whisky sauce. Or at least this has been my experience in all restaurants in Scotland that proudly claim to be Scottish with regard to the style of food rather than the ingredients. So it was with a sense of weariness that I followed the fiancé and Micky to Fitzrovia on the appointed day for our Scottish dinner. But then, to my great relief, I found myself stood outside the shotgun handled door of Mac & Wild. 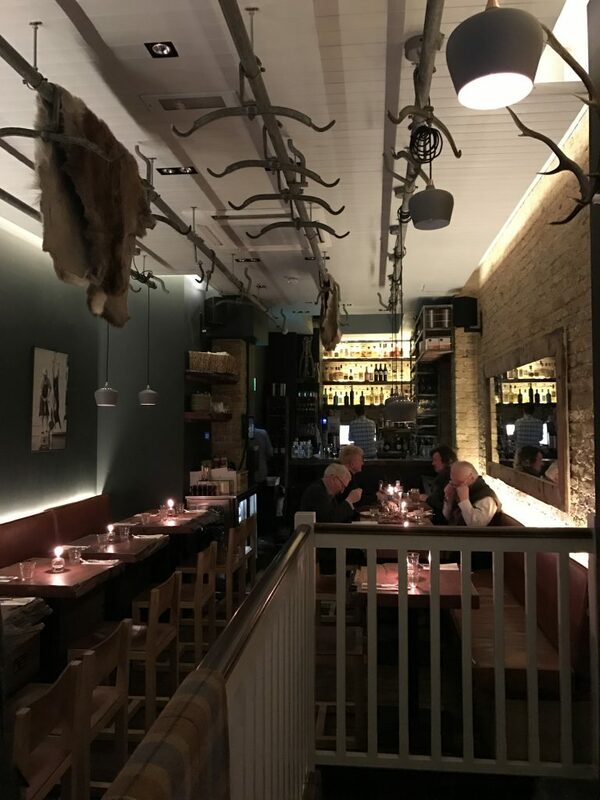 Open for a bit over two years now, Mac & Wild is the first permanent restaurant of Andy Waugh’s Wild Game Company (a former popup in Fitzrovia). Their second larger site is at Devonshire Square. The driving ethos of the group is ‘gun to table’, an ethos that is carried through so completely that, at the top of the menu, it states not just the estates the beef and venison come from, but also who shot it and butchered it, something that they have to be applauded for. Better yet, for hungry diners that is, it’s the home of the Venimoo, the winner of Best UK Burger 2016 and Best Burger in London 2015, while each dish on the menu has a suggested whisky paring. Thankfully, when you step inside there’s not a square inch of tartan in sight. Instead, the narrow restaurant is a dark charcoal blue, with black and white photos of deer stalking hanging on the wall over tables made from polished strips of tree trunks. Metal bars hang from the ceiling leading to the bar at the end and are dressed with the odd deer hide, a nice touch I thought. Colour comes from the books, cases of Irn-bru and brightly coloured bottles of the bar’s cocktails on the wall by the stairs to the lower level, and their cocktails really are good – and lets face it no restaurant these days can afford to have a bad cocktail list. 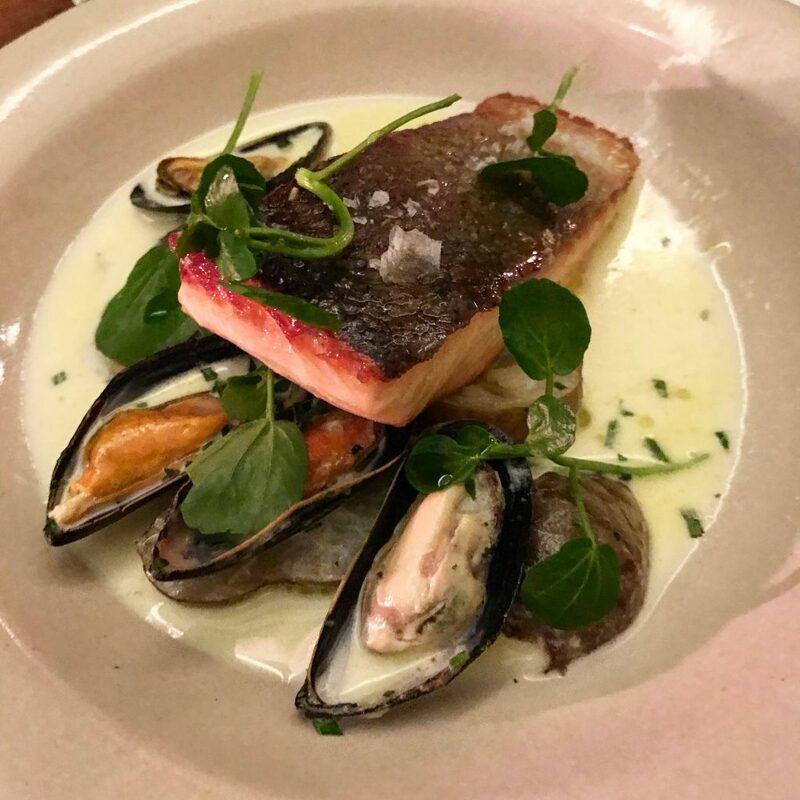 When it came to ordering, there was no question, we had to have the Venimoo, of course, with sides of chips and the green beans with black pudding and shallots, though Minnie chose the salmon with mussels, Jerusalem artichoke and truffle cream, along with a side of ‘dirty buttery mash’. Starters, or as they are called in that twee Scottish way ‘wee plates’, of venison tartare, and duck egg and mushrooms were ordered. Served to a backdrop of one of the best soundtracks I’ve heard in a restaurant for a long time – a mix of Nina Simone, Michael Jackson and more up to date hits – the starters were presented on simple crockery that fits in with the eclectic second hand cutlery (one of my forks was hallmarked solid silver with a crest on it) and the use of old gin and whisky bottles as water carafs for the tables, all somehow complementing the theme of a hunting lodge or hunter’s picnic. The duck egg with truffle oil, roasted mushrooms and croutons was the perfect example of why, for all its simplicity, this rich earthy dish is a classic always worth ordering. 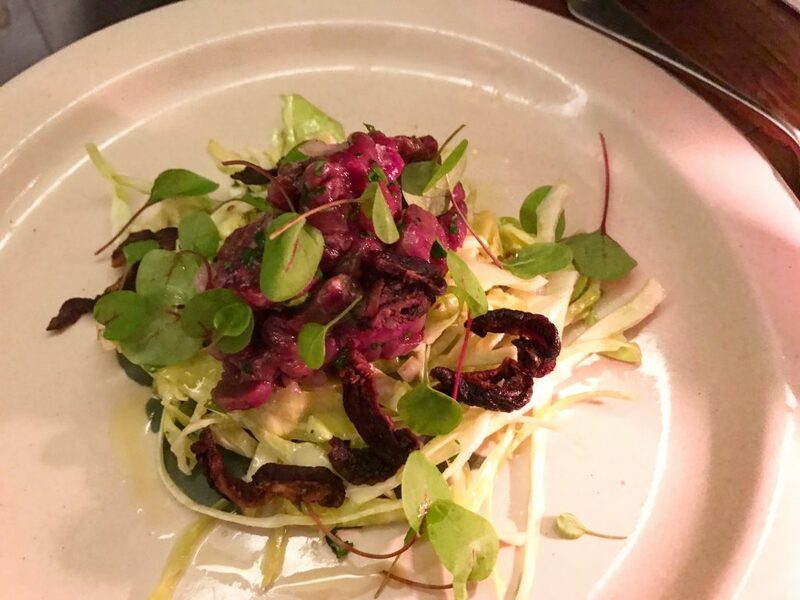 The venison tartare was spot on and, with the interesting addition of glazed mushrooms that almost seemed to be dehydrated, the only downside was that the dressing for the salad it sat on had a tendency to overpower the delicate tartare. The salmon was beautifully pan-fried and the mash potatoes glorious in their smooth and buttery perfection. The elegance and subtly of starters and salmon were in stark contrast to the Venimoo (and the other steaks and burgers on the menu), served up on a tray with the chips in a metal pot next to it. 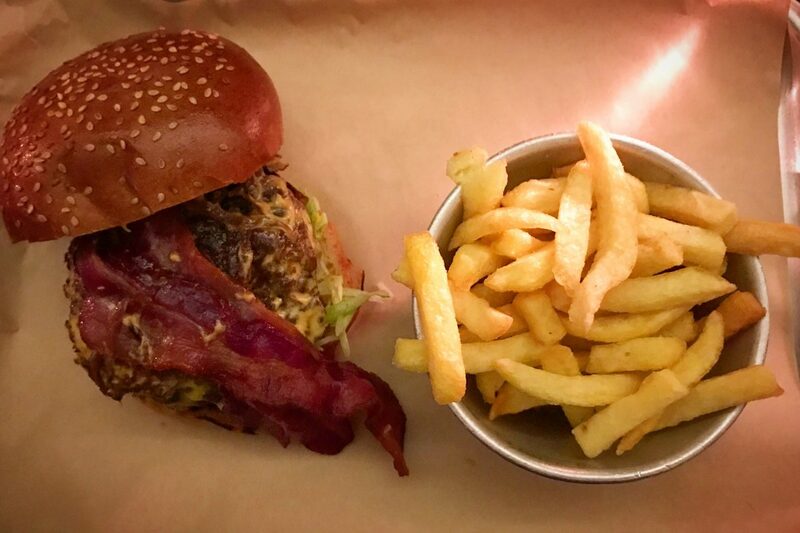 This double patty – one beef the other venison – in a brioche bun sitting on shredded lettuce, caramelised onions and pickles, and topped with cheese, candied bacon and smothered in béarnaise sauce, just oozes meaty thrills. It’s easy to see why the Venimoo is an award winner. Somehow it at once reminds one of a Bleecker Street burger, crossed with a Dirty Burger, mixed with a Big Mac, simultaneously reminding me of some of the best burgers about today and my childhood eating Big Macs on a Friday evening after swimming training. 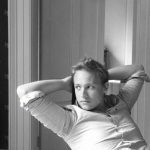 Would I call it the best burger in London or the UK? No, I’m afraid I will never waiver from the belief that the Bleecker Street double cheeseburger with extra bacon should hold that title. That said, it’s certainly up there and you’ll hear no complaints about this unctuous, perfectly cooked, seasoned and flavour packed burger from me. But these things are subjective, so you should go try it for yourself. Plus how often do you get a venison patty? Mac & Wild is certainly worth a detour to Fitzrovia, especially if for a dinner with friends on a Friday night. The ethos of the restaurant perfectly flows through into the décor (even the Victoriana toilet plays into the idea of a Scottish hunting lodge), menu and extensive whisky and cocktail list. It’s the closest I’ve felt to being out on a hunt in the Highlands since I was last up there. The food is simple, well thought through and perfectly executed. The only problem about going back to Mac & Wild that I can see is the difficult choice that awaits me: the Venimoo or the Meat Plate, with its mouth wateringly good sounding beef short rib, homemade sausages, pork belly and venison topside accompanied by the dirty buttery mash and the green beans with black pudding and shallots. But somehow I think I’ll manage to overcome that dilemma, and then I’ll be back for the bottomless brunch.